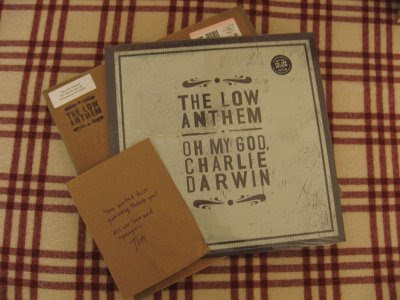 In other news, my copy of The Low Anthem's 'Oh My God, Charlie Darwin' has finally reached Chalky Towers all the way for Providence, Rhode Island. This made me very happy and was by far the most exciting parcel I received today (in fairness foot cream and a replacement Dyson hose aren't really in the same league are they?) Here's the pretty awful photo I took of the delivery. 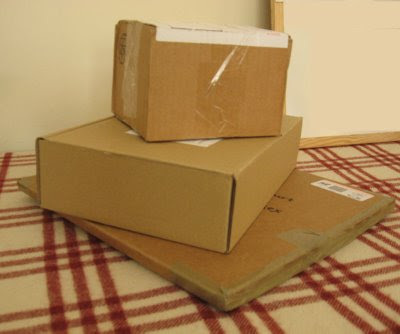 I love getting hand written notes with parcels. Tonight I plan on mixing myself a G&T with a slice of frozen lemon, turning my phone off and putting my feet up to listen to this. Playing a new vinyl is always a special occasion, playing a Low Anthem vinyl is extra special.